Flexispy Review – The Monitoring Software with 150+ Features, Is It for You? 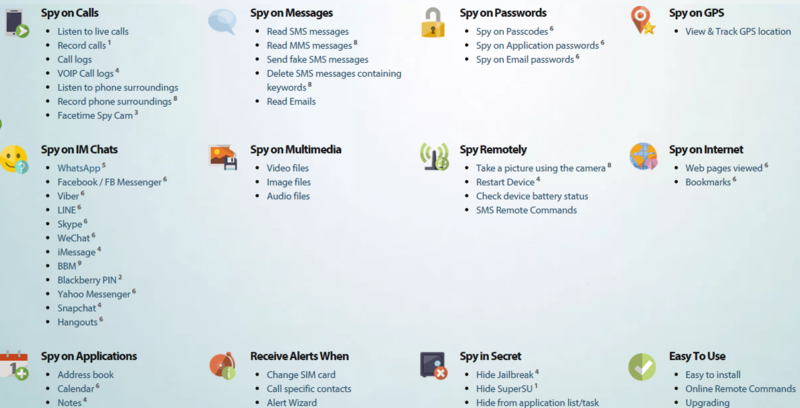 Flexispy is a very modern mobile spy software that can be used to monitor data, texts, calls and messages for ultimate parental or business control. With a wide suite of features, Flexispy is fast becoming one of the best data monitoring software products designed for mobile out there today. In this review, we take an in-depth look at what makes this monitoring software special, and give details on how it stands out from the crowds of other monitoring services available online. This software comes with a wide range of different features, but it’s best parts have been listed below. 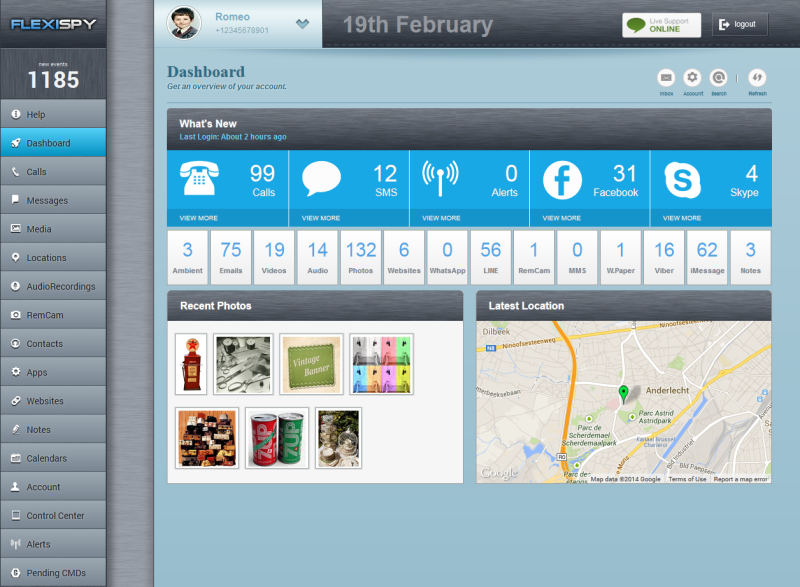 Flexispy focuses on three different pillars – child protection/parental control, employee monitoring and relationship spy. Monitor all messages – find out what is being said to or by your child, significant other or employees. 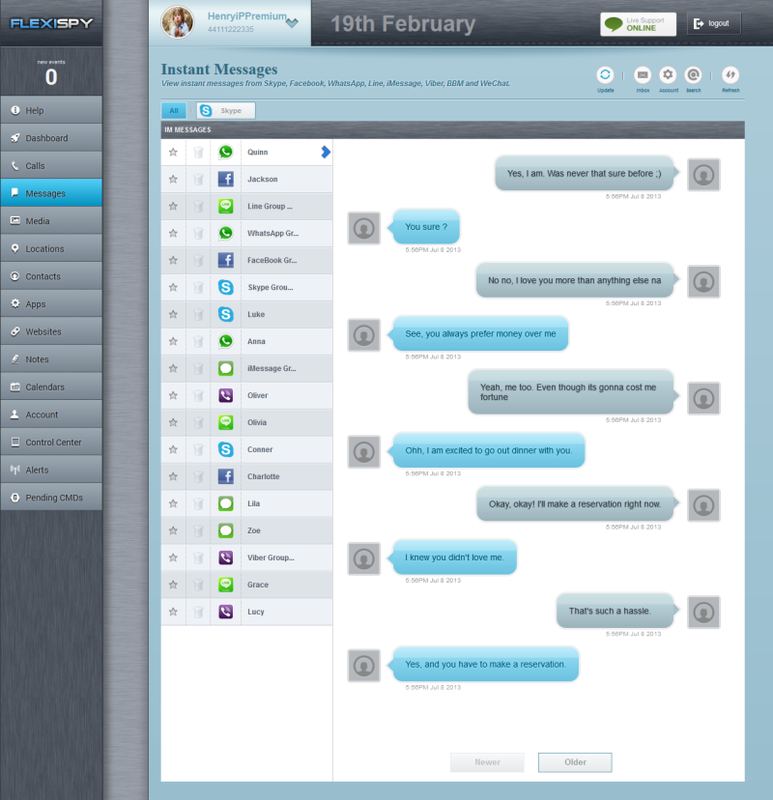 Text messages, IM messages FlexiSpy has an impressive list of message monitoring. Track Location – Track the location of those you are monitoring 24/7 through the advanced user friendly monitoring dashboard. Alerts – SIM card change alerts, contact alerts and more. Save and keep logs – Keep track of everything said and done by employees, children, or partners and those they are communicating with incredibly easily via the dashboard controls. There are many benefits to using Flexispy, and in this review we take a look at the benefits provided for the three main pillars we discussed previously. Parental benefits – Smartphones and tablets are great pieces of technology, but they give our children access to a wide world of dangers and troubles that your children may not understand how to avoid. Giving your child untethered access to internet and instant messaging is almost like sending them out on their own into the big wide world, but with parental controls and monitoring you can make sure that everything is contained within a safe environment. Business benefits – Hiring employees can be a very expensive process, and without monitoring their smartphone activity there is no way of knowing how much time (and money) they are wasting on the job by visiting websites or messaging friends and family from their phone whilst working. By monitoring their smartphone activity you can keep track of who is sticking to their work and who isn’t. There are many great features packed into this phone monitoring software that make it a strong competitor against today’s top alternatives. If you are unsure what communication is being had between your child or employer, a simple call monitoring tool can be used to track their call logs for ingoing and outgoing calls. Track time stamps and monitor when and where calls are being taken. Like many phone monitoring suites, this software does come with extensive text monitoring. Monitor sent and received SMS messages, archive texts and browse through all messages sent in the past. An interesting addition to this is the delete SMS function. You can actually delete incoming messages that include specific keywords that you have specified. This can be a great way to keep your child safe and not even let them receive harmful incoming messages. As well as a strong, reliably text monitoring tool, this software has a range of instant message monitoring tools to give you all the details on the messages being sent outside of the message app. Many people have dropped sending texts to use free IM apps, so a decent instant message monitor service should be a part of every good smartphone monitoring app. If your child or employer is acting up, keep track of their location data – see their previous locations and take a look at where they are right now. You can also set location boundaries. This means that if your child leave a safe zone that you will get notified. This can be great if you want to keep your child safe after school for example, you will immediately get notified if she leaves the safe area. Another area that you might want to be able to keep an eye on, is the multimedia files, like pictures and videos. You don`t want, what seem like innocent pictures, to get into the wrong hands. You also want to be able to protect your child from receiving inappropriate pictures. FlexiSpy will allow you to not only monitor images and video files but audio files as well. With FlexiSpy you will be able to see all websites visited, get the time and the data of each visit. You can also see all websites bookmarked on the device. Is your child visiting inappropriate websites? FlexiSpy will help you find out. FlexiSpy will allow you to monitor and set alerts. There are a few different alert settings that can be used. SIM change alert – if the SIM card is changed you will get an alert. Call notification – get a notification when a specific call is made. Keywords – you can set keywords in text messages, IM and emails to alert you when being used. Location – set alerts when certain areas are visited. The expansive dashboard that comes alongside this software has over 150 different tools, some of which have already been suggested. Whilst others are available on other services, the large majority of them are unique to this software. There are a few things that no other monitoring software on the market offers these are call interception and recording, room ambiance recording (covert activation of mic and camera). As an example, with this software you can listen in to calls in real time to see what is being said instead of a conversation. If call logs aren’t giving a good enough picture, you can easily listen to calls to get information that would otherwise not be shared through messages or call logs. If you are serious about using the very best mobile monitoring software out there, this software is definitely at the top, and it’s feature packed dashboard easily sets it apart from many other competitors. Whilst lots of other services do offer similar tools to this software, you’ll find it very difficult to find a dashboard that is as streamlined and effective as the one found within the software we are reviewing today. There is no doubt that this software provides incredibly easy tools that anybody can get to grips with, and it still has a wide range of other tools that make it one of the most feature-filled solutions currently available today. Feature wise the only thing that we can possibly point out is the lack of some parental control tools. To be able to block websites and some apps for example. Phone number on their website, we do miss that. This software supports a wide range of different mobile operating systems, and they can all be managed from one device. This software can support iPhones, iPads, Android phones and tablets, certain Blackberry smartphones, and certain Nokia smartphones. Certain features, such as the spy call, and the smartphone password cracker, are offered as standalone tools, and they do not come with the premium toolset for each operating system. There are two main products offered, FlexiSpy Premium and FlexiSpy Extreme, when it comes to monitoring smartphones. The Extreme version includes everything offered. Each OS is packaged into a different product, and standalone features. Below, we have listed the different packages that this software offers. Android – Spy on Android mobile phones and tablets. FlexiSpy now offers monthly and quarterly payment as well. $68 monthly and $99 for 3 months for premium version. $199 for 3 moths for extreme version. Android password cracker – This tool will help you crack email passwords like gmail and hotmail. It will also crack application passwords like Facebook, Twitter, Skype and more on Android devices – $49.99/month if you get this product only. Apple password cracker – Crack passwords on iPhone and iPad. Example passwords that can be cracked are iCloud, Mac, Hotmail, Facebook, Yahoo, Linked In and more – $49.99/month if you get this product only. FlexiRECORD – Record calls and spy on calls through your PC. Features – this is a feature packed product. Price – it is a really good price if you break it down to its monthly cost. Dashboard – easy to use and easy on the eyes. Updates – FlexiSpy is constantly updating the program. Like some other monitoring software you do have to jailbreak or root the smartphone if this is not done already. The marketing on their website seem to invade privacy. FlexiSpy offer live support and a ticket center, you can also email them at info@flexispy.com. There is no visible phone number on their website to call them. This is a program that has been on the market since 2004, great features to a great price. The upgrade to Extreme is a little pricy so it depends on if you need those features. Over all this is a product that stands out. +Regarding relationship spying – We are doing an objective FlexiSpy review. Depending on the laws in each state or country, it may be illegal to go through someone’s cell phone that you do not own.